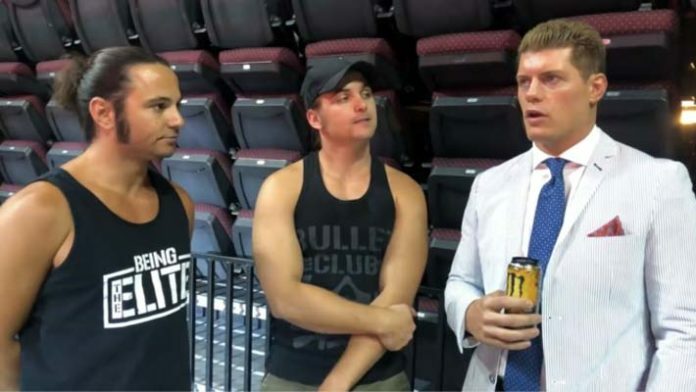 Nick Jackson Tells Fans, "Enjoy Us While We're Still Here"
Correction: Earlier this week, Nick Jackson of the Young Bucks posted a photo on Instagram hyping their upcoming match at WrestleKingdom 13 against the Guerrillas of Destiny and EVIL & SANADA. The caption included the line, “Try to enjoy us while we’re still here. We don’t have much time left!” Our original article stated that Jackson was referring to the Bucks’ time in New Japan. This was an error on our part – Jackson clarified on Twitter that he was referring to their careers, not just their run in NJPW. We have edited the article to reflect this sentiment and apologize to the Young Bucks and our readers for the misinterpretation. Didn’t mean that at all. I was actually referring to our careers. The Young Bucks were recently added to the IWGP Heavyweight Tag Team Championship match at the upcoming Wrestle Kingdom 13 event. This decision from NJPW management caused some backlash from fans. The match was originally expected to be between the champs and Bullet Club Members Tama Tonga & Tanga Loa and World Tag League winners EVIL & SANADA. Since the Bucks did not participate in the World Tag League, a lot of people showed their frustration on this decision online, calling their inclusion to the bout unfair. For the record, if putting us in a tag title match “doesn’t make sense” that’s not our fault because we just try and do our job and to make every tag match we’re in the best tag match you’ll see. Try to enjoy us while we’re still here. We don’t have much time left! The Young Bucks still haven’t confirmed what the future holds for them after Wrestle Kingdom. The Elite has vowed to stick together in 2019. Cody recently revealed that he declined an offer by WWE, a strong indication that the Bucks are not WWE bound either. Stay tuned.